That’s right, I said corn – I found this great 1940’s sequin applique dress, but instead of the typical bows or flowers, this one features what could either be corn or yellow grapes. For our purposes, I’m going with corn and this is the sparkly equivalent of a novelty print. If I were heading to the Hawkeye Swing Festival or the Heartland Swing Festival, I would pick this up in a second. Adorable! 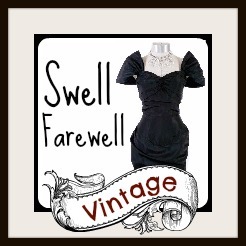 This entry was posted in 1940's, Ladies and tagged 1940's dress, Balboa, black, dance, Lindy Hop, sequin applique, swing. Bookmark the permalink. 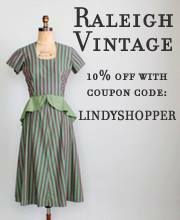 You could also wear it to the Cowtown Jamboree in Omaha, NE! They have a corn-eating contest and everything. This is gorgeous, by the way, and I would wear it in a heartbeat!